Everything Just So: Bergdorf Goodman Windows: A Work in Progress! Bergdorf Goodman Windows: A Work in Progress! One of the shades used when the windows are being prepped. Last month when I swung by Bergdorf Goodman to see if they had any lovely new windows for me to gaze at I was surprised to find that the majority of them on Fifth Avenue, except for this window featuring an embroidered blue dress (below), were literally under wraps! Note the brown paper wrap all around this dress to protect the white floor below. I was disappointed for about a minute until I realized that there were stylists/visual merchandisers in one of the windows prepping it for display and they worked without the benefit of the screen! What a great peek, literally, into what it takes to get the windows ready for view. The sun was directly on the stylists and they seemed mildly annoyed, probably because it was hot and they had to work in blinding sun. I noticed three people on the outside who probably worked for the store as well, looking at the window from the sidewalk. I wish I could’ve held up a sign that said LOVE YOUR WORK to the talented gals and guys behind the window, making all of our fashion dreams come true! I count the Bergdorf Goodman windows one of the many treats of living in New York City. The visual wizards working their magic both outside and inside the window! 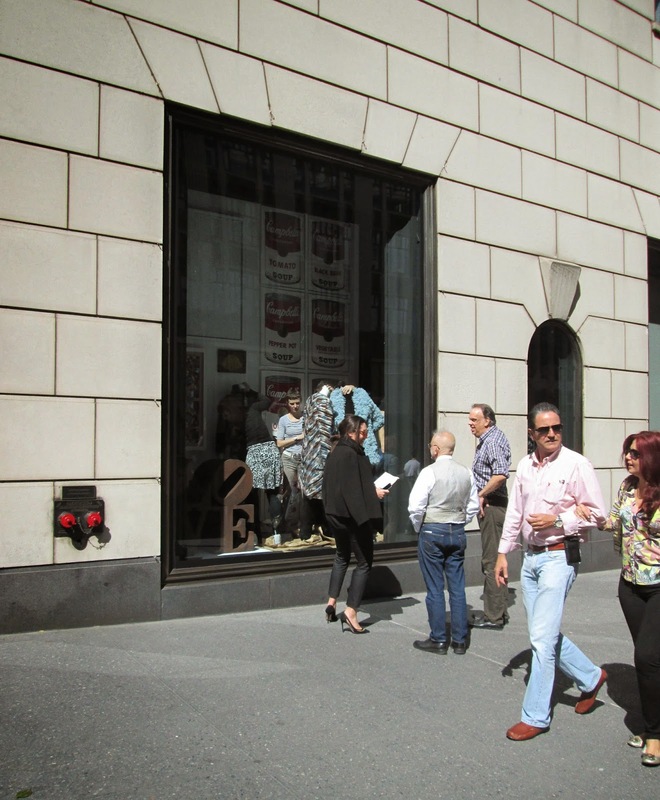 On 57th Street the windows were visible. I love this great red coat by DVF! The windows on the 57th and 58th Street sides of the store were available for view and I fell hard for coats shown in each—the red one by Diane von Furstenberg, the green one with the sky blue lacing (love!) by Dior. 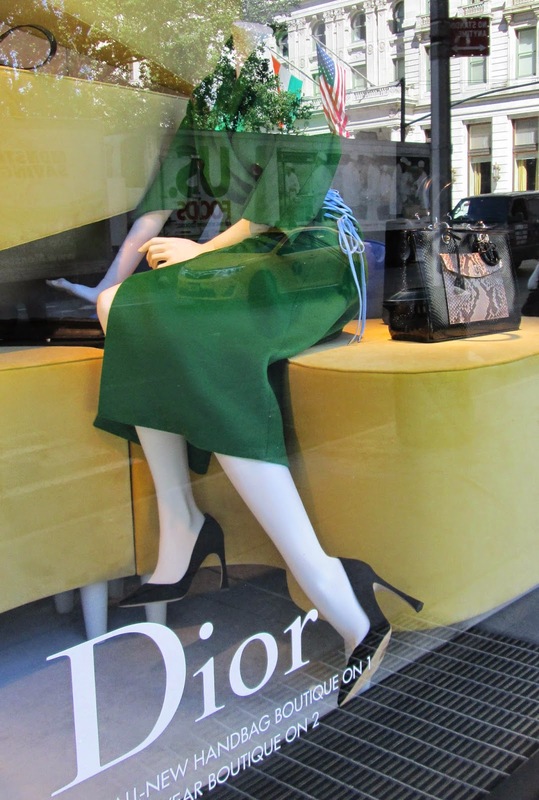 I love the blue side lacing on this green coat by Dior. Have you seen the doco 'Scatter my Ashes at Bergdorf'? If not you'd love it and they do a good bit on how these Christmas windows come to be. Highly recommend! Quite surprised at your take. I came away from it quite taken with the wonderful Linda Fargo and more favorably impressed with BG. I've found that my mood has an enormous influence in how I view movies. Saw Master & Commander at theatre when it came out when tired on a Sunday night (and with date who checked her watch every 5 minutes while muffling yawns) and then saw it on Netflix at my leisure and loved it 2nd time around. For all the years I lived in NYC or just outside of it, I have never ever tired of looking at Berdorf's windows. A feast for the eyes. The Plaza Hotel is still fabulous;although, I really miss the Oak Bar). Hi again GSL, I was already a big fan of Linda Fargo before I saw the movie so my impression of it had nothing to do with her. I was delighted to meet the feisty Betty Halbreich in the film and I am now reading her wonderful book. Re moods and movies, maybe I was too excited to see it? It's possible that I had other expectations and that's why it didn't click with me. However, I am ready to see it again and I won't be surprised if I like it better the second time around. I always love it when you take us window gazing, Jill. Makes me miss NYC so much. Thanks for the tour!